The fieldTransformation is a complex object which defines a transformation that can be done to a message. In this example, the host name is extracted from the URL by way of the URL_TO_HOST function. 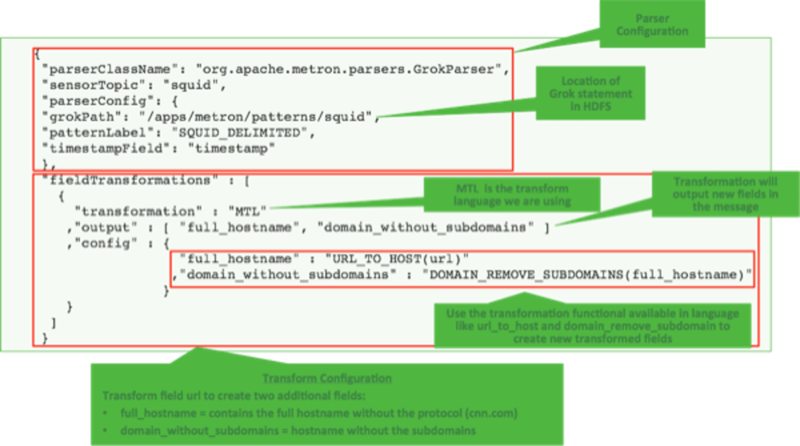 Domain names are removed by using DOMAIN_REMOVE_SUBDOMAINS, thereby creating two new fields (full_hostname and domain_without_subdomains) and adding them to each message. An array of fields or a single field representing the input. This is optional; if unspecified, then the whole message is passed as input. The outputs to produce from the transformation. If unspecified, it is assumed to be the same as inputs. The fully qualified class name of the transformation to be used. This is either a class which implements FieldTransformation or a member of the FieldTransformations enum. A String to Object map of transformation specific configuration. This transformation removes the specified input fields. If you want a conditional removal, you can pass a Metron Query Language statement to define the conditions under which you want to remove the fields. "condition" : "exists(field2) and field2 == 'foo'"
This transformation maps IANA protocol numbers to consistent string representations. This transformation executes a set of transformations expressed as Stellar Language statements. The UNIX epoch timestamp based on the timestamp field, a dc field which is the data center the message comes from and a dc2tz map mapping data centers to timezones. The host associated with the url in the url field. The protocol associated with the url in the url field. Note that the dc2tz map is in the parser config, so it is accessible in the functions.